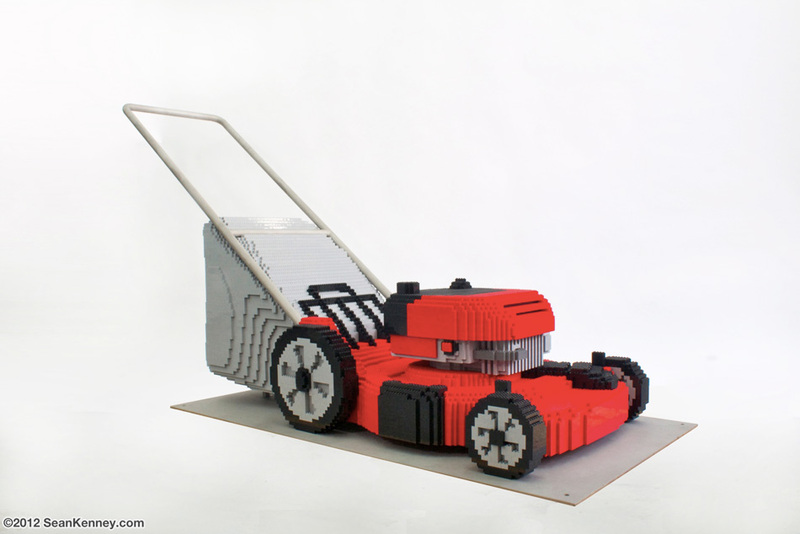 This life-sized lawnmower contains 13,704 LEGO pieces and took 200 hours to design and build together with my team of assistants. It's designed as a "photo op" where visitors can walk up and grab the handle for an awesome photo of lawnmowery LEGO goodness. David Pagano, LEGO animator extraordinaire, took the lead during construction and built this sculpture over the course of about 5 weeks. The sculpture took over 200 hours to design and build by my team and I. Each piece is glued one-by-one and a steel armature helps keep the sculpture secured to the ground. David is actually an asthmatic druid. Whew! Mowing my LEGO pieces off the floor is hard work!